On the right is my Memorex 3270 terminal next to the PC running 3270 emulation via TN3270. From Right to left: The MVS Master Console, the 3081 system console and then the tape console (closer to the tape drives of course). The first drive you see is the "IMS" tape drive for the IMS log. 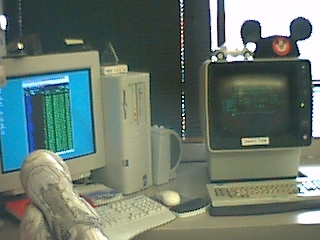 When the system crashed (and it did often when we had the 370/168, the IMS programmer would come out and stare at the IMS tape drive after the IPL). When it started moving all was well. Speaking of the 370/168. These terminals are sitting where the main 370/168 consoles used to be. Eventually they were moved into a small room so as to be away from all of the computer room noise. From my first job where I was a tape ape (then help desk and then systems programming).